April 23rd is the UNESCO World Book & Copyright Day and Sant Jordi, a day when love and literature are massively celebrated in Barcelona and all over Catalonia. People exchange books and roses as a token of appreciation. 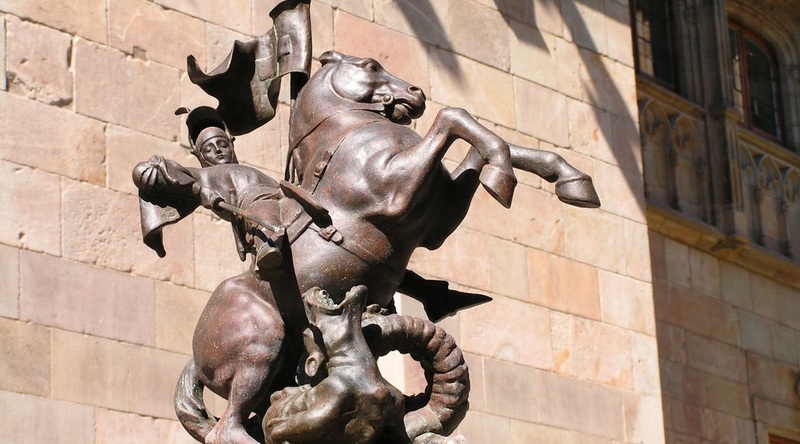 The tradition has become so popular that Sant Jordi is now celebrated all over the world! Here is where you take part in this Catalan tradition in the US and Canada! POEZIO, foreign languages poetry festival: Intermediate Catalan II students will read their poems. A special edition of CAFÈ CATALÀ: exchange of books and roses and Catalan refreshments. Catalan speakers of any kind, past, present or future, all welcome! Program for children: Readings and workshops: roses, dragons and more. Organized by Catalan Institute of America, in collaboration with Ferragut Fund for Catalan Culture in the US. April 19-28 – discover Catalan literature at the Gallimard bookstore in Montreal! Tuesday April 23 – 1 :30-5 :00pm – Exchange of books and roses at the Carrefour interdisciplinaire et interculturel (CII), Département de littératures et de langues du monde, Université de Montréal, followed by a party from 6 :00 to 8 :00pm! Saturday April 27 – Reception offered by the Cercle culturel Catalan at Maison des écrivains in Montreal. Organized by Cercle culturel catalan du Québec, Librairie Gallimard and Médiathèque en études catalanes de l’Université de Montréal. Pa amb tomàquet Cooking Tutorial. An introduction by Vera Balmont, UMass exchange student from Barcelona. Open Literary Reading. Bring your favorite literary texts in any language! Red roses, coffee and treats for all! Sant Jordi Day 2019: Francesc Parcerisas - "Still Life with Children"